New Delhi, Nov 24 (PTI) India's MC Mary Kom Saturday won a historic sixth gold in the Women's World Championships, the mother-of-three doing, without breaking a sweat, what no other woman boxer has done or known before. 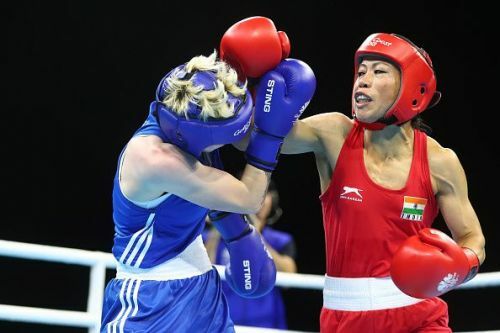 The 35-year-old Mary Kom out-classed Ukraine's Hanna Okhota in an unanimous 5-0 verdict in the 48kg category summit bout. The Olympic bronze medallist came into the all-important bout optimistic of adding to her five world championships titles, and, without an iota of doubt, she walked the talk against Okhota. Before this World Championships, Mary Kom was tied with Ireland's Katie Taylor (five gold and a bronze) on the number of medals won by a woman. Taylor now plies her trade in the professional circuit. With this gold, 'Magnificent Mary' also matched Cuban men's legend Felix Savon as the joint most successful pugilist (men and women) in the World Championships history. Mary Kom won a silver in the inaugural edition in 2001 and then went on to win a gold each in the next five consecutive editions -- 2002, 2005, 2006, 2008 and 2010. Overwhelmed, Mary Kom broke down after coming out the ring as she went around to greet the packed stadium and the assembled officials. Wrapped in the tri-colour, she thanked her fans for their "unstinted" support. "I am a little bit emotional. There is no (48kg) weight category in the Olympic Games. Because of your love and support, I feel I will be able to qualify for 2020 Tokyo Olympics. Four years ago, I was not able to qualify for Rio. I am still suffering from that," she said. "Thank you for your love and support. I don't have anything to give except for a gold in the country. I know it will be a bit difficult for me to win a gold in Tokyo as I will have to fight in 51kg." Mary Kom claimed a bronze at the 2012 London Games.